The most obvious thing to have as visible as possible on your website is your contact information (address and phone number), and along with it, your menu. Your menu is probably the very first thing that your website user would look for, whether it is to make a decision to dine in or to order online. Whatever their reason, you need to make sure that you offer a straightforward journey through your menu on a desktop platform, but, most importantly, on a mobile device. Outsource your menu to third party provider - although this option has constraints in terms of how much you can customize your menu visually, it is a good alternative if you want an off-the-shelf and ready-to-go solution. Some options are SinglePlatform and Popmenu. Identify your star items as well as your challenge items and show them first. These are respectively the ones that are popular with a high contribution margin and the ones that are profitable but relatively unpopular. Use short and to-the-point descriptions. No one wants to read a book. You can be creative, but you still need to be straightforward and tell quickly your food. Keep your menu uncluttered. It should be really easy to ready and figure out what your food is about. Long -or short- disorganized menus will push users away. Download this 11-step checklist for your next website redesign. Online ordering is what’s going on right now. It surfaced really strong in 2017 and it is here to stay in 2018. 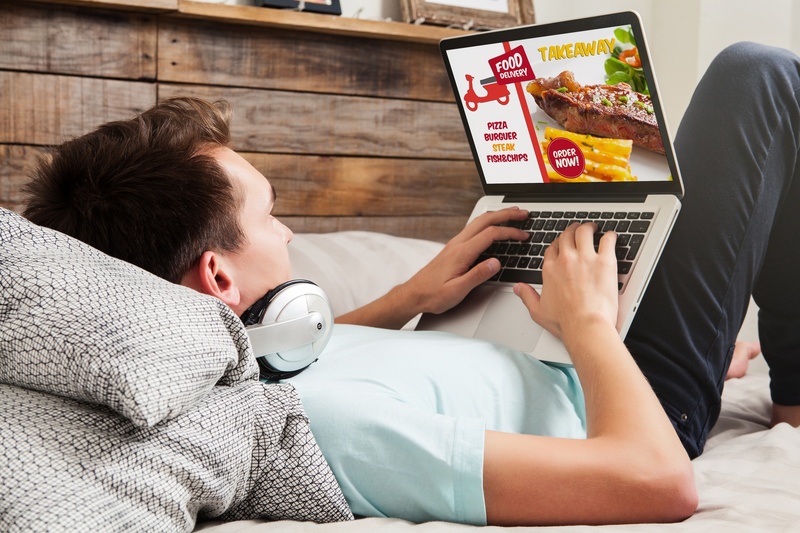 The birth of online ordering comes from convenience and the fact that it is not for pizza joints anymore… You can be sitting at home or your office and, if you want a gourmet burger, you can easily order it online and have it delivered to your doorstep. So, in order to capture your share of the online ordering market, you want to make it as easy as possible for diners to order their food. Your online ordering system should be easy to use and intuitive, which in turn will help with the user experience and turn website visits and orders into cash. Order online and deliver - for those who don’t want to leave the comfort of their home. For this option there are a few alternatives such as DoorDash, Uber Eats, Yelp Eat24, GrubHub, etc. Many restaurants survive on coupons and deals, and many restaurateurs believe that they can keep a steady streamline of business with such strategy. However, instead of many one-timers, you would want the repeat customer. This is where loyalty programs fail. If you have a loyalty program that is coupon driven, you’re having people coming in only for the deal, not for your food or restaurant experience. If you’re thinking of implementing a loyalty program, or if you already have one in place, make sure that your focus is on your existing customers and the added value that you give them when joining the program through unique experiences. For example, VIP new menu items previews or tastes, members only special drink when they buy two entreés, accrue points and get something when you have so many points, etc. On average, members of a restaurant loyalty program will spend up to 20% when redeeming their reward and they will also increase their visits frequency. Where are you and how do I contact you? The importance of your contact details. In point # 1, we mentioned the importance of your contact details. It is very important that your phone number and location is easy to find on your page. This is even more true for users on mobile devices. Organic search engine optimization is more valuable today than ever before. The reason is because, unlike PPC, organic SEO ranking stays with you. The best way to approach SEO is through relevant content, a mobile friendly (responsive design) and a performance-optimized website. Google and every other search engine love these features when crawling and ranking sites. So, consider updating your restaurant website often and maybe adding a blog so you can have regular, relevant and fresh content. The team at Kulture Konnect can help you create beautiful, responsive websites that support you in driving business to your restaurant. We do this with a mobile first approach and by staying up-to-date with design, user interface, technology trends, and, most importantly, a streamlined user experience. Ready to take your restaurant website to the next level with an online menu, blog and beautiful look? Get your free website consultation today!